Just back with my month end instagram 'saved snaps' meets photo dump. 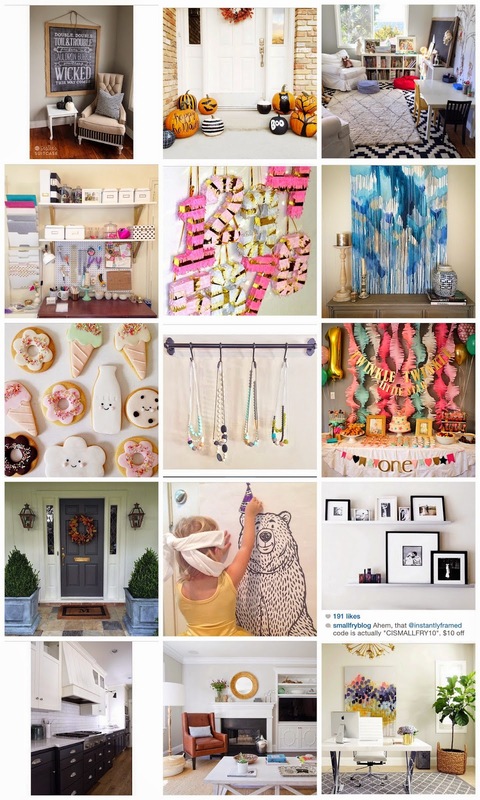 Lots of decor inspiration, favorite art styles, sweet party details, halloween and organization ideas. That giant pin the party hat on the bear will definitely be making an appearance at Kenley's party and those cookies are beyond. I know sometimes seeing perfectly styled shots through dreamy filters can actually do more harm than good, but it's always nice to see something that sparks your own imagination and ambition. What are your favorite account inspiring you lately?? I'm dying to get a plant like the one pictured in the bottom right... but too scared Rae will dig in it all day. I need more space on my iPhone for this exact reason, so many fun things! Oh my gosh I cannot wait to see more of your party inspiration for Miss K!!! love all these pics! the cookies are SO cute and that twinkle dessert table backdrop... swoon! Love love love this idea and stole it (and credited you!) last week for some Halloween saved snaps. I seriously have TONS though and love this way of documenting them and sharing them. I don't follow all of those accounts you shared but I might have to now. Such good shares!